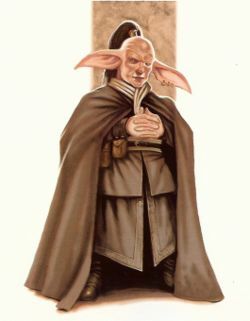 The only surviving founder of the Unified Force Academy, Queil is the diminutive, brilliant headmaster of the school. He’s also one of the major architects of its Unified Force school of thought and is famous (or rather, infamous) for his ability to demolish the philosophical arguments of his opponents. Some of the students whisper that he has grown stubborn and proud in his old age, an opinion that even a few teachers share. Still, he commands the respect of everyone at the Academy and has been known to even browbeat the planetary governor into submission on those rare occasions in which he’s left the academy grounds. He argues for a more aloof monastic Jedi tradition in which they deal not with the every day concerns about the galaxy, but things that truly endanger the balance of the Force.